Il Poggiolo can only be reached by car (or by bicycle or on foot if you are an intrepid traveler). Il Poggiolo is located approximately equidistant from Florence, Arezzo and Siena. We are on Google Earth as “Il Poggiolo Holidays in Tuscany” – coordinates: 43°29’36.14″N 11°35’39.30″E. Here’s how to find us: these directions sound complicated, but they are so precise it is hard to go wrong! USEFUL TIP: print this page and bring it with you! Otherwise you may have a LOT of difficulty finding us (cellphone/tablet reception is not always good along country roads). These directions sound complicated, but that is because they are pretty much fool proof!! As country roads can be difficult to navigate in the dark, we strongly suggest that you plan to arrive before dusk on your first day. Please call us (+39) 055.9911058 or +39-348.605.7338 the day before your arrival in order to confirm the approximate time you will arrive. From the Autostrada exit to il Poggiolo should take max.15-20 minutes, depending on traffic. Take the Autostrada del Sole (A-1) to the VALDARNO exit. After the toll booths, exit to the RIGHT and follow blue and white signs for AREZZO / LEVANE. You will see a long row of box stores and fast food concessions on your left. At the end of this commercial strip you will be directed to a RIGHT curve and almost immediately (just after the gas station) to the LEFT on a short 2 lane road. Here you must get into the RIGHT lane. You will take the RIGHT fork to get on a secondary road in the direction of AREZZO / LEVANE . This road runs south, in parallel to the A-1 highway, which can be seen at times (on the right). After a couple of kilometers you will be directed over a beautiful new bridge (the “Ponte Leonardo”) which will take you above the highway to the other side of the Arno river. There will be several rotaries, just follow the signs to LEVANE/ MONTEVARCHI. At the 3rd rotary, take the right turn for MONTEVARCHI. After 1 km you will pass under an overhead bridge that spans the road diagonally. On the bridge itself is a big sign marking the border between LEVANE (crossed out in red) and the next township: MONTEVARCHI. Just AFTER this overhead bridge turn LEFT onto a little road called ”via Caposelvi” (there are signs for “CAPOSELVI” and “CAMPITELLO”). Turn LEFT, cross the bridge. Go straight and follow the road as it curves to the LEFT below a small hamlet, around a couple of curves, and up through the woods. If you are driving a manual shift, downshift to 1st or 2nd gear as soon as the hill starts to climb (depends on how heavily your car is loaded) !!!! PLEASE NOTE -The dirt road is narrow and there are a couple of tight curves. Make sure you have your headlights on (this is law in Italy now, even in daylight), keep to your side of the road, and honk your horn vigorously before each tight curve to alert any oncoming car…. or truck or tractor ! 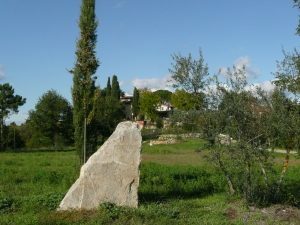 IMMEDIATELY after you come out of the woods (about 500 meters after the little bridge), there is an open field on your LEFT, with a marker stone on which is engraved “IL POGGIOLO” (see photo above). At the landmark stone turn immediately LEFT onto a dirt road that skirts a field, above which is the group of houses known as “Il Poggiolo” (you’ll recognize it from the photo on this page). The dirt road ends in 3 driveways, come up the middle driveway to the TOP of the hill – you will have arrrived! 1) take the Pisa-Firenze road (called FI-PI-LI) towards Florence, switch to the A1 (toll) highway in the direction of Rome (this takes place before you reach Florence, at Scandicci). Continue South on the A1 towards Rome. The VALDARNO exit is the second after Firenze Sud. Follow directions given above. There is often construction in progress on this road, so while it is the shorter road distance-wise, it may take more time. 2) take the “Firenze-Mare” highway (A11 toll highway, green signs, direction Florence). Before reaching Florence, at “Firenze Nord,” there is the switch to the A1 in the direction of Rome. The VALDARNO exit is the second after Firenze Sud. Follow directions given above. At exit of airport, turn right and get on highway (following green and white signs). Before the first toll booths, there is a service station and an exit for A1 Bologna/Rome highway. Take this exit and follow the A1 towards Rome. You’ll be doing a loop around Florence, from the north to the south sides of the city, without having to drive through it. Once you are on the A1 in the direction of Rome, continue south to the VALDARNO exit (second after Firenze Sud) and follow directions given above. You will need to provide Il Poggiolo with the original of your Passport or EU identity card for check-in registration. We suggest you always travel with several photocopies of your document, so as to be able to leave the original in a hotel safe or in your rental accommodation. Please a few minutes immediately upon arrival for a quick introduction to the quirks of the house, so as not to find yourselves wondering how to open certain windows, or risk having your computer fried by a sudden thunderstorm. IMPORTANT – Please note that if you do NOT have an EU driving license, you should travel with an official translation of your current driving license or an international driver’s license in order to drive in Italy. According to your nationality, consult the website of your nation’s embassy in Rome for more information, and the internet for quick service websites. For car rental, please note that pick up and drop off in our area is fraught with logistical problems. We warmly suggest getting your car at an airport or in Florence, and arrange for drop off anywhere but in our area. The car rental agencies are NOT a convenient distance from the local train station, they can have odd hours of business, and local taxis can be hard to get.